Alyssum Carpet of Snow Lobularia Maritima is a compact garden annual and popular ground cover. 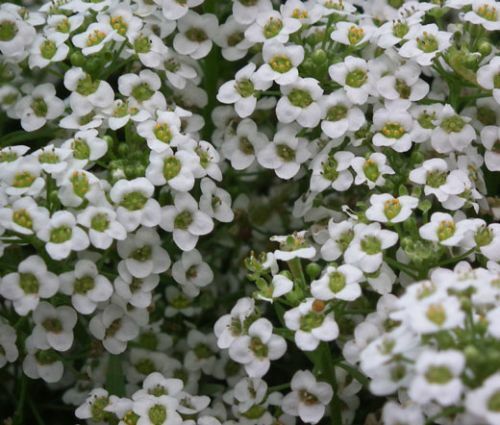 Also commonly referred as Sweet Alyssum and Sweet Alison this compact annual is easy to grow from seeds, and the fast growing White Alyssum blooms with clusters of snow-white, fragrant flowers forming a mat-like ground cover. Alyssum begins to bloom in spring and blooms until frost producing highly ornamental, honey-scented flowers that attract bees and butterflies. Alyssum Carpet of Snow is a low-growing Alyssum variety, and this dense, mat-forming, flowering annual plant is commonly used in borders, rock gardens, containers, and pots. Lobularia Maritima tolerates many types of soil and likes to grow in full sun or partial shade.